James is researching his PhD on the relation between agricultural books, knowledge & labour in eighteenth-century Britain, at King’s College London. He also works as the Academic Administrator, Georgian Papers Programme. Panel at the talk, ‘Just Write It, I’ll make it work’: King George III through the eyes of Alan Bennett & Nicholas Hytner’, Edmond J Safra Lecture Theatre, King’s College London All rights reserved. The mental illness of King George III and corresponding political crisis of 1788-89 was “a gift”, said the playwright Alan Bennett, speaking at the opening of this year’s Arts & Humanities Festival on Monday 10th Oct alongside theatre and film director Sir Nicholas Hytner. The king’s descent and recovery formed “a self-contained episode”, while the connection between an individual’s plight with national politics was perfect theatre: you couldn’t wish for “a more dramatic plot”. 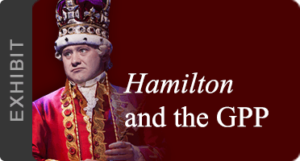 Thus the episode became the acclaimed play, The Madness of George III, later adapted into the Oscar-winning film. This raises a series of questions: was the plot already there in the historical record? How much was in the eye of the playwright? And how does the eye of the historian differ? In the film the messenger, George himself, does arrive on time to avoid the tragic ending, performing his sanity for Parliament to prevent the passing of the Regency Bill and the effective end of his reign. No doubt some of the dramatic potential Bennett saw in the 1788-89 regency crisis was because he already knew the dramatic tale of Shakespeare’s mad king. A twentieth-century dramatist reading about the life George III would inevitably see Lear, with countless other lesser characters and subplots from wider culture. The decision to end with the recovery in 1789 rather than the demise of a blind and deaf old man in 1820 allowed the film to finish on an upward trajectory. This king would not end as Lear had. The relation to Shakespeare’s tragedy is indicative of the complex blurring of literature and history. Shakespeare derived his character from the pre-Roman legendary King Leir of the Britons, as described in the twelfth-century chronicle of Geoffrey of Monmouth, through a potentially diverse range of sixteenth-century histories and plays. But in earlier versions, Cordelia lives and restores Lear to the throne. The tragic ending was introduced by Shakespeare. Such are the circle of influences that shape the narrative of a king’s madness: screenplays upon histories upon scripts upon chronicles upon legends upon – what? Think of the profusion of stories that were filtered through Shakespeare’s quill in the early 1600s; elements of which found their way into the minds of the politicians, physicians and courtiers in 1788, even the King’s own collapsing faculties, and were scattered through the hall of mirrors of action-interpretation-reaction; the sum total, again, combined and refashioned through the typewriter of Alan Bennett in the early 1990s. Yet the story has a twist: after the Restoration in 1660, it was the adaptation by Nahum Tate that formed the basis for the staging of King Lear for the next one hundred and fifty years. And Tate’s revision had a happy ending. The King Lear known in the 1780s was not the same tragedy that we know today. However, the king still exhibited a violent madness and the comparison with the malady of George was all too painfully obvious. The play was eventually banned from the stage in the period of his final and inescapable mental retreat from 1810 to his death in 1820. Each history hides a tale; each tale has a history. However, in a famous scene, Bennett uses Lear in another way: it is through the public reading of Shakespeare’s play that George is shown to have recovered his sanity: “Your Majesty seems more yourself.” It is, ironically, his ability to play a role that is not himself that demonstrates his capacity to truly be himself. This is a common definition of madness: the inability to distinguish between what is real and what is fiction. The fact George can perform as a fictional character and know that is what he is doing signifies his return to normality. The film as a whole is an exploration of the complex relation between kingship and madness. As Dr Willis remarks, “the state of monarchy and the state of lunacy share a frontier”. How do you tell if a king has delusions of grandeur? The behavioural treatment of Dr Willis seeks to break down the King into a mere human being, to separate the individual from his office of kingship – that is, to remind the King that he is only playing a role. “I have remembered how to seem”, the King says with fresh lucidity. Many historians accept that the practice and writing of history involves a necessary act of imagination. The arguments of Hayden White that historical writing mirrors literature and relies on narrative forms for meaning and interpretation have been influential and controversial. We do not need to accept the full structuralist baggage of tropes and emplotments to appreciate the way “literary” forms shape historical writing and interpretation. What plots do historians see in the archives? What beginnings and endings, characters and agency, tragedies and parodies? But more than this: what narratives do historical actors see and experience and how does this shape their behaviour? 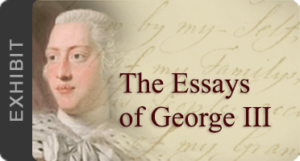 Did George III perceive himself as a tragic hero? It is often said that the particular value of history is the way it blends the arts and sciences. Perhaps we could say it is the peculiar madness of historians to artfully confuse fiction and reality, until the latter achieves meaning.